St. Nicholas was born on March 15, 270. Or perhaps July 29, 280. The stories that have come down to us vary on the date. But according to all the stories, St. Nicholas was born in Patara, a trading city on the coast of the Roman province of Lycia. Today, Lycia is part of Turkey, and Patara is in ruins. But when St. Nicholas was born, trade had made Patara a prosperous community. His parents, Theophanes and Nonna, had shared in that prosperity. They were pious people, prominent not only for their wealth, but also for their almsgiving and virtues. They named their only son Nicholas. It was an unusual name at the time, but it was the name of his beloved uncle, who was the bishop of Patara and perhaps the abbot of a nearby monastery. It was later seen to be a prophetic name. Nicholas means Victory of the people. And St. Nicholas, from his childhood to this day, has always defended ordinary people in difficulty or distress. There are old, odd stories surrounding the infancy of St. Nicholas. It was said that, when he was baptized, he stood in the font unsupported for three hours, in honor of the Holy Trinity. He would nurse only from his mother’s right breast. On Wednesdays and Fridays, in some of the stories, he would nurse only once, after his parents completed their evening prayers. In other stories, he refused milk entirely on those days. What are we to make of such stories? They may be hagiographical tropes. Storytellers use tropes to convey something about a character without getting sidetracked with long explanations. In old Western movies, a man in a white hat is one of the good guys. In medieval romances, a woman with gray eyes is beautiful. It doesn’t matter what color the hats or eyes really were – that’s not the point of the trope. And babes who refuse to nurse on fast days during their infancy show up in hagiography often enough that it may be a trope. It signifies that the babe was holy from birth, and would go on to be recognized as a saint. These sorts of stories could also have developed through the folk process – that is, by small changes that accumulate as the stories are told and retold over time. It may be that those who knew St. Nicholas and his family said that St. Nicholas lived a life of strict asceticism, keeping all the appointed fasts from childhood. A later storyteller may have emphasized that point, saying that the saint fasted “practically from the day he was born.” And it’s not hard for “practically” to drop out, and for us to receive a story that has babies refusing to nurse on fast days from birth. The folk process doesn’t just happen in stories of saints. Everything we know from the past is a best guess, assembled from old stories, artifacts, and records. Figuring out what happened in history is like working a jigsaw puzzle, where the picture on the box has been partly ripped away, and many of the pieces are missing. Historians typically say that the only thing we know for sure about St. Nicholas, the only fact as we understand it today, is that he was the bishop of Myra in the first half of the fourth century. The rest is guesswork and surmise. Did he free men who had been unjustly accused? Probably. Did he attend the Council of Nicea? Maybe. Did he slap Arius? Maybe not. Did he restore to life three boys who had been murdered and pickled by an evil innkeeper? Almost certainly not. That doesn’t mean that the stories aren’t important. Saint stories are like the stories we tell of our aunts and uncles, grandparents and great grandparents. They’re family stories. They tell us what it means to be part of this particular family. They tell us what personality traits are common in our family, what virtues we celebrate, what foibles amuse us. Those things remain true, whether the details of the story are exactly what happened or not. But there is one story about St. Nicholas that is almost certainly happened just as we have received it. As it happens, it is the best known of all the stories of St. Nicholas. 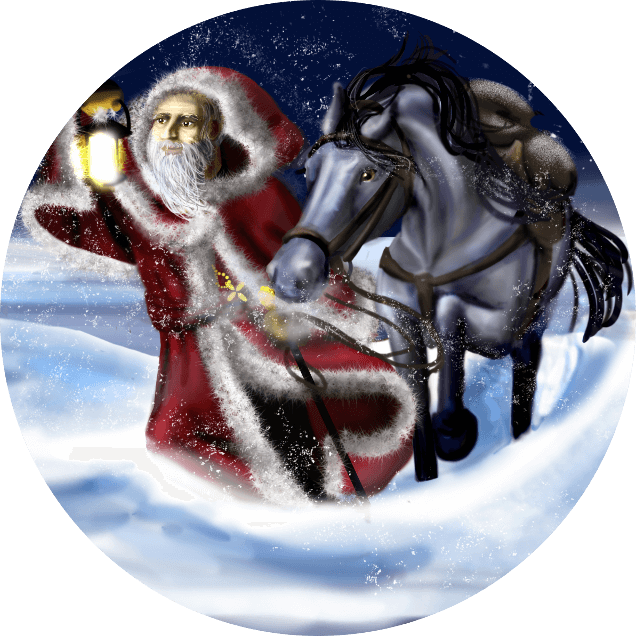 It is the story that is alluded to even in stories that make the saint an elf and have him riding in a magical sleigh. It is the story of the widower’s daughters. In this story, St. Nicholas secretly provides gold to allow the daughters of an impoverished neighbor to marry rather than to become prostitutes. He slips the gold in through a window, and it lands in a shoe, or perhaps in a stocking that was washed out and hung to dry. Of course, there are no documents, no artifacts attesting to this story. But it describes an event from St. Nicholas’s life that almost certainly happened. Details may have changed as the story was told and retold. (I tell one version here. Peter’s godfather tells a slightly different version in The Saint Nicholas Day Snow, to settle an argument between the children.) But the story itself, gold given secretly to save the girls – that happened. How do we know this story is true? Scholars accept this story as true in part because it is one of a kind. There is not another story remotely like it in the lives of other saints – or anywhere else. It can’t possibly be a trope. In addition, St. Nicholas intended the gold to allow the widower’s daughters to marry. During St. Nicholas’s time, marriage wasn’t considered holy. It wasn’t something that people would expect a saint to support. If someone had invented the story, they’d have had the girls taking up life as nuns. The fact that St. Nicholas provided for their marriage gives weight to the idea that the story happened just this way. And the story appears in the oldest versions of the life of St. Nicholas that we have. It isn’t a late addition. Other stories: Did they really happen? We can use the same criteria to understand some of the other stories about our beloved saint. 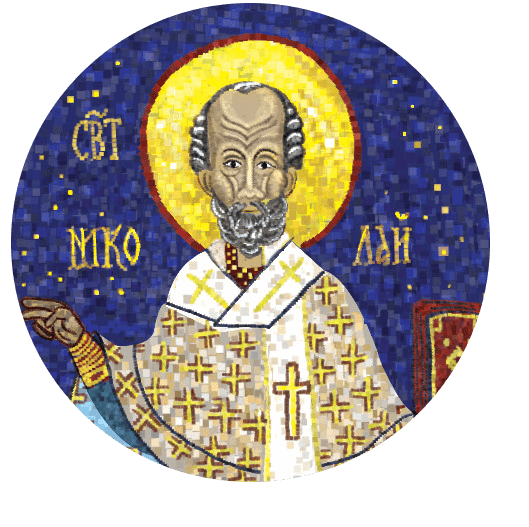 Did St. Nicholas slap Arius? The story of the altercation between St. Nicholas and Arius doesn’t show up until a thousand years after the council. It is such a dramatic story, and there are enough records of the Council of Nicea, that the absence of this story from contemporaneous accounts is problematic. We can’t even be certain that Nicholas was at the council. And if he was, the earliest accounts of this particular story don’t mention Arius himself. Instead, it is “a certain Arian” who disputes with Nicholas. It takes another couple of centuries for the Arian to become Arius. Now, it’s possible that “a certain Arian” was meant to be understood as Arius. And it’s possible that there are undiscovered manuscripts that would reveal it as an older story. But, based on what we have, scholars generally say that the story seems unlikely to have happened. Not impossible. Just unlikely. And for a long time, I accepted the scholars’ arguments. But I’ve come to think that the story is likely true. Not in all of it’s details, of course. Maybe St. Nicholas didn’t slap Arius himself. But the dreams make me think that he really did slap a certain Arian. Did St. Nicholas rescue three men who were falsely accused? What about the story of St. Nicholas freeing three men who were about to be executed based on lies? That one seems likely to be true. The details are fuzzy, from a historical perspective. Two versions of the story have come down to us. They may describe two separate incidents, or they may be two versions of the same story. But, as with the story of the widower’s daughters, it’s not a story that you find outside the life of St. Nicholas. So it seems likely that St. Nicholas, indeed, saved three innocent men from execution. What about the boys who were butchered? The boys who were butchered, then brought back to life? It’s another story that is unique to the life of St. Nicholas. But it’s not an old story. And there is nothing about it that rings true. The story may be based on icons that depict the story of the three men who were unjustly accused. In these icons, the men are shown as if they were standing in the dock in a courtroom. In some of the images, according to the artistic tropes of the time, the saint is very large, and the men are very small. It appears that some storytellers knew the icons, but not the story. They misunderstood the small men as children, and the dock as a barrel, and made up a story to fit. Why does Santa come on Christmas Eve? From the earliest years the Church, Christians honored saints on the anniversary of their death, not on the anniversary of their birth. And St. Nicholas died on December 6. So, for nearly two thousand years, Christians have honored him every year on December 6. And in most countries where St. Nicholas brings gifts to children, that’s when he comes. In America, though, he usually comes on Christmas Eve. In the 1800s, and particularly in the latter part of that century, America was a divided country. Urban and rural, immigrants and non-immigrants, wealthy and poor seemed to live different lives. They didn’t understand each other. They didn’t even much like each other. And so it happened that, during this time, specifically American customs began to develop, to help unify the fragmented nation. Many of the Christmas customs we know today were created during this time. The festivities were designed to feel old-fashioned and sentimental. People decorated their homes with evergreen and holly. They learned about the English custom of Christmas trees, and adopted it wholesale. Employers began giving them the day off work so they could celebrate with friends and family. They began sending Christmas cards. Moore was a scholar, and he surely knew that St. Nicholas’s feast day was December 6. But in the 1800s, few people in America kept saint days. And St. Nicholas had always had something of an association with Christmas anyway, because his feast day falls during Advent, during the time of preparation for Christmas. So Moore used his artistic license to move St. Nicholas’s visit to Christmas Eve. In recent years, some families have chosen to move it back to December 6. Some want to honor the saint. Others simply want to keep the focus of Christmas on Christ. But whether it’s December 6 or Christmas Eve, St. Nicholas remains the most well known and most beloved saint of the Christmas season.